Baby & children skin should not be exposed to direct sunlight, especially under the age of 3. In today's environmental conditions it is extremely important to make sure a child wears a hat and the predominant part of the body is covered with a swimming suit, T-shirt and shorts, when playing at the beach or outdoors! Sebamed brings to you a complete sun care protection for your little one! 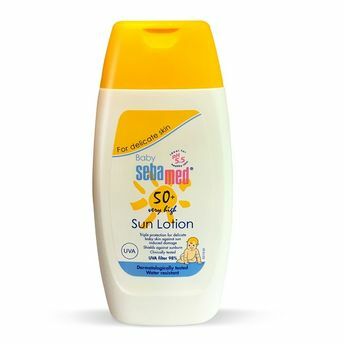 Keep the delicate skin of the baby protected from harsh sun rays all day long with Baby Sebamed Sun Lotion SPF 50+. The Baby Sun lotion filters 98% of UVA rays and protects against allergies caused by the Sun. It prevents sunlight induced damages, skin irritations and protects against dryness of baby delicate skin. Highly effective UVA/UVB filter system combined with micro-pigments prevents sunlight induced damage and irritation to skin. Additional Information: Science for healthy skin. Sebamed represents one of the leading brands for medicinal skin care with a pH value 5.5 of healthy skin. All Sebamed products contain high-quality active ingredients which cleanse and nourish the skin without destroying the natural acid protection mantle. Produced exclusively in Germany, these products have been tested dermatologically and clinically. The product range includes skin care range for sensitive and dry skin, right from the delicate baby skin to youthful problem skin and mature skin to the male skin. Added to this are the special care for the face, hair care products, and deodorants. Explore the entire range of Body Sunscreen available on Nykaa. Shop more Sebamed products here.You can browse through the complete world of Sebamed Body Sunscreen .